The Clemson men’s basketball team will face EA Sports on Monday evening at 7:00 PM at Littlejohn Coliseum. This will be Clemson’s final exhibition game prior to the Tigers’ season-opener against Gardner-Webb on Friday night. Tip-off for the first game of the season is slated for 6:00 PM at Littlejohn Coliseum. 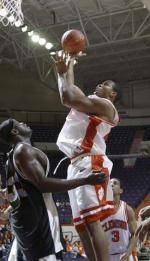 Clemson won its first exhibition game of the season, defeating Nike Elite by a score of 85-68. Chris Hobbs and Chey Christie led six Tigers in double-figure points with 15 each. Sharrod Ford added 14 points with three blocks, and Shawan Robinson dropped in 12 points with five assists. Olu Babalola tallied 11 points with eight rebounds and nine assists, while Akin Akingbala posted a double-double with 10 points and 13 rebounds. EA Sports’ roster includes nine former collegiate players, including former Wake Forest player Broderick Hicks who played for the Demon Deacons from 1999-2002. Most recently, George Washington defeated the All-Stars by a score of 87-64. Lawrence Moten led EA Sports with 15 points, while Tezala Archie added 11 points and three assists. Josh Murray pulled down eight rebounds with six points and a block.